CarGurus has 14,440 nationwide X5 listings starting at $2,199. From the gate, BMW built the X5 to handle like a 5 Series, and three generations and dozens of extra on-board computers haven’t dulled this BMW’s terrific sensations behind the wheel. Once upon a time, a large, utilitarian BMW was a 5 Series station wagon and nothing more. Today, BMW sells eight high-roof models in the U.S., only one of which is a genuine wagon. The X5, first introduced for 2000, is the best-selling of BMW’s crop of sporty SUVs and crossovers. Its success as a fast, swift-handling, jacked-up wagon with all-wheel drive convinced Porsche to build the Cayenne, and if you’ve ever shopped at a mall with a Williams-Sonoma, you’ve seen them flood the parking lot. But is this third-generation X5 still a worthy choice, now that every mainstream luxury automaker builds at least two SUVs? Let’s find out. 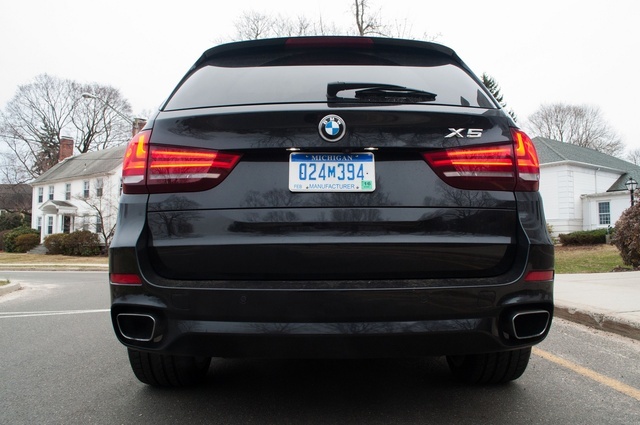 Redesigned for 2014, the latest X5 is so familiar it almost feels like a mid-cycle refresh, with sharper, crisper detailing and new rims rounding out the exterior changes. From most angles, the body is so conservative it could wear a Volvo badge. Inside, the X5 ditches the subgrade presentation of the previous two generations for plusher materials, fancier two-tone color choices, and all-around greater comfort. 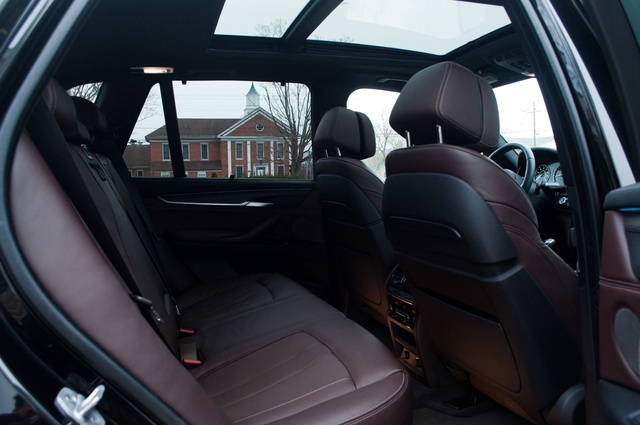 While BMW is planning a larger, pricier X7, the X5 already feels like a tall 7 Series (with ambient lighting and matte-finish wood among many lavish amenities). BMW starts out with simple math: Five trims, 5 seats, 4 engines, 3 body kits, and all-wheel drive (AWD) standard for all but the base rear-wheel-drive (RWD) sDrive35i. A third row with space for 2 children is optional, as was any sense of fiscal restraint on our xDrive50i. Check every box and you’ll need a calculator to create a $95,000 X5 (hello, $1,900 headlights!). Ours was no doubt a custom order few dealers would attempt to sell (at that price, they’d jump you to the top-level X5 M for a few thousand more). 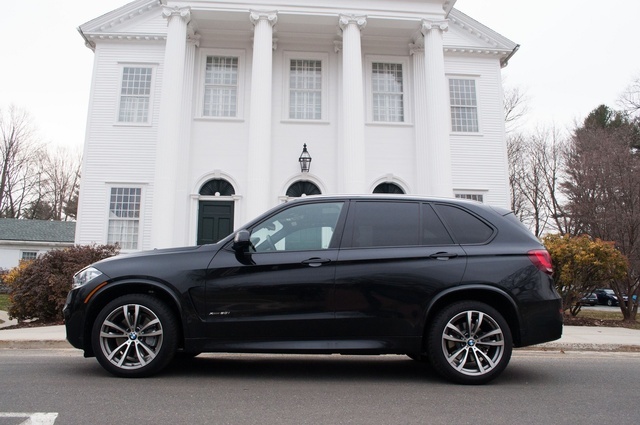 Instead of our decked-out model, you’re likelier to go home with an X5 like the $67,000 xDrive35i we tested separately. From the gate, BMW built the X5 to handle like a 5 Series, and three generations and dozens of extra on-board computers haven’t dulled this BMW’s terrific sensations behind the wheel. Mostly. That wheel, like the one in all BMWs with electric power steering, suffers from artificial feedback as the gear motor lightens and tenses under load. It’s the only unnatural and inexcusable trait in an otherwise superb chassis. The way the X5 glides along city streets without crashing the suspension over bumps would be praise enough, yet on 20-inch summer tires it grips for days with less body roll than a Miata. 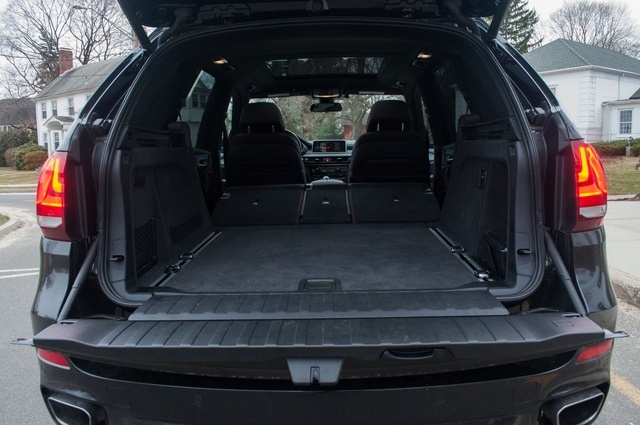 Credit the adaptive dampers for their commendable job shrinking the X5’s two-and-a-half tons, although unless you want to spill coffee all over the beautifully stitched mocha leather, skip the powertrain’s overly stiff Sport+ mode. (And if you want winter traction, skip the summer tires, too.) We tried Eco Pro, an oxygen-starved hell that lets BMW claim high fuel economy, and let our X5s breathe in Comfort mode. Here’s what happens when you put your foot down in the xDrive50i: You blast past four Manhattan blocks in the time it takes to hail a nearby cab. This 4.4-liter twin-turbo V8 is stealth-bomber quick, with 445 hp and silky smoothness as it works its way up the 8-speed automatic. The door sills show the BMW Motorsport logo, and for once on BMW’s many M Sport trims, the 8-cylinder X5 deserves the commendation. It pulls almost as hard as an M3. In Greenwich, our cousin stole the keys and hit unpublishable speeds in his sleepy neighborhood. Guard them like your insurance rates depend on it. 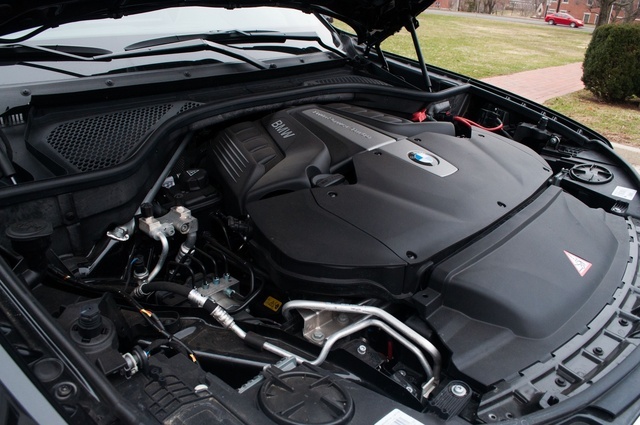 Down a few pegs is the 3.0-liter twin-turbo inline 6-cylinder in the xDrive35i, which serves 300 hp with a velvety exhaust note and broad torque. It’s our preferred engine (we recorded 24 mpg versus the V8’s 17 mpg), unless you’d like to save even more with the diesel xDrive35d or burn a Texas oilfield with the 567-hp X5 M. Braking is nothing short of phenomenal, with firm pedal feel and minimal body dive in both 6- and 8-cylinder versions. Only the Porsche Cayenne feels more nimble and stable. “It looks expensive, because it is.” That was how Land Rover designer Gerry McGovern described a new Range Rover, and the same sentiment applies to this big Bimmer. With its silver-painted nostrils flaring out between four circular LED “eyes,” the X5 stares down other drivers with just enough scorn to force them out of the passing lane. As with all BMWs, the X5 has a deceptively simple-looking dash, with physical volume knobs, radio presets, and climate controls. This is a huge deal, as car designers trying to save money and look trendy put many of these controls in the digital realm, where they’re more difficult to operate. But when BMW does go digital, it does it right. Take the multi-color heads-up display, which projects navigation, audio, phone, and speed information on the windshield. It’s not a new concept, but it’s so graphical and precise that you’ll know exactly which lane to choose or how long it’ll be before the next turn. Want to find your favorite song on your phone? Toggle the central display, thumb the steering-wheel buttons to engage the heads-up display, or look down at the wide LCD that virtually completes the physical tachometer and speedometer with even more computer graphics. If you’ve stepped out of a 15-year-old car, the X5 requires an intense learning curve. Even if you’re a pro, you’ll need to put in hours to master the iDrive controller, which sits in the center console and rotates, scrolls, pushes in four directions, and accepts touch inputs. Mentioning what our loaded xDrive50i didn’t have would take up the length of a tweet. Before we go further, know that nearly everything here requires a multi-thousand-dollar package that bundles options that come standard on many a Toyota Highlander, such as side window shades and satellite radio. Then there are others you may not want, like soft-closing electric doors. But you must take it or leave it, since that’s what BMW and all the German automakers do. Cameras positioned all around the vehicle merge into an overhead view to make parking an incredible cinch (if, that is, you don’t let the X5 park itself). The 10.2-inch LCD screen has a digital owner’s manual that’s searchable and even plays videos and diagrams explaining the car’s various features. 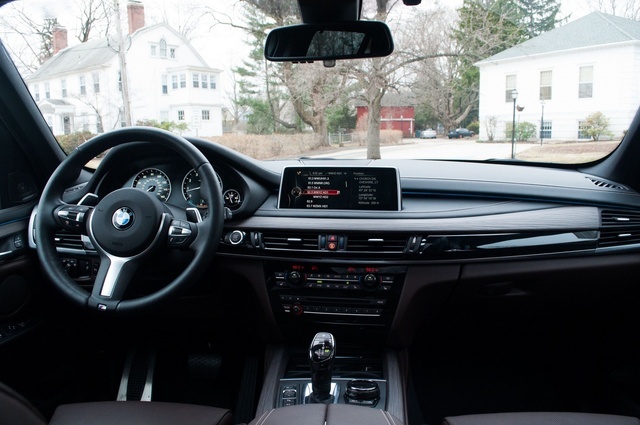 Within the iDrive menus, BMW lets you tweak the backrest-to-cushion ratio of the seat heaters, look at live traffic, browse the Internet, check the oil level, or spot pedestrians with night vision. It’s totally unnecessary. Fun? Absolutely. The Active Driving Assistant, when coupled with adaptive cruise control, can stop the car in traffic and get back on the gas when the car in front creeps forward. The LED headlamps pump out enough lumens to singlehandedly light up a construction zone. The booming stereo and customizable LED accent lighting on the dash and doors are a Miami nightclub without the $2,000 bottle service. Tip the doorman enough, and this BMW will bring it to you. As expected, the BMW X5 earns 5 stars from federal crash tests and the top Good rating from the Insurance Institute for Highway Safety. All the usual airbags and stability control features are present, along with others that only luxury brands like BMW tend to offer, like brakes that dry themselves in the rain and compensate for fade over repeated stops. The optional Active Driving Assist brings forward collision alert with automatic braking for cars and pedestrians, plus lane-departure warning. Blind-spot monitoring and a backup camera are available (and of course aren’t standard). But from the moment you shut the door, the frame’s solidity is a welcome reminder that you’ll be well protected in most accidents. Shut the door on a Highlander and you’ll hear a hollow pang. There’s a reason the X5 is expensive. Go moderate on the option packages, as most BMW dealers do with X5s on their lots, and you’ll find a luxury SUV with few equals. It drives, operates, and is finished more nicely than the Mercedes ML-Class (newly renamed the GLE-Class), Acura MDX, and the Audi Q7. As we’ve stated before, only Porsche can outdo the X5 in outright performance, yet it can’t approach the X5’s safety features and becomes prohibitively expensive even for this class of car. Despite how disappointing the new 3 Series has become and how lost BMW seems when it makes a car like the 5 Series GT, the X5 stays true to the brand. 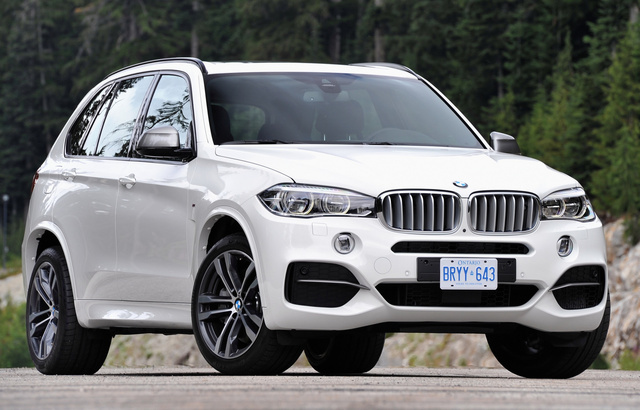 What's your take on the 2015 BMW X5? fleuger99 Just an FYI, the base sDrive 35i is rear wheel drive not front wheel drive. mb230slk Bought a new 2015 X5 last November (2014). 3rd seat takes away a spare tire. Run flats on car are terrible. Folding down the 2nd row seats makes the head rests bump into the front seats. BMW manual says to move the front seats forward to allow the carrying area to go flat?. Car now has 4000 miles on it ( one year old),Brake discs have rust, causing car to rumble when braking.Not covered by BMW warrenty, would cost 3,000 to replace.Traded a Volvo XC 90 for the BMW , parked the same way, and never had a brake disk rust problem. Even have a Mercedes 1999 230 SLK, parked the same way , no problems. Users ranked 2015 BMW X5 against other cars which they drove/owned. Each ranking was based on 9 categories. Here is the summary of top rankings. 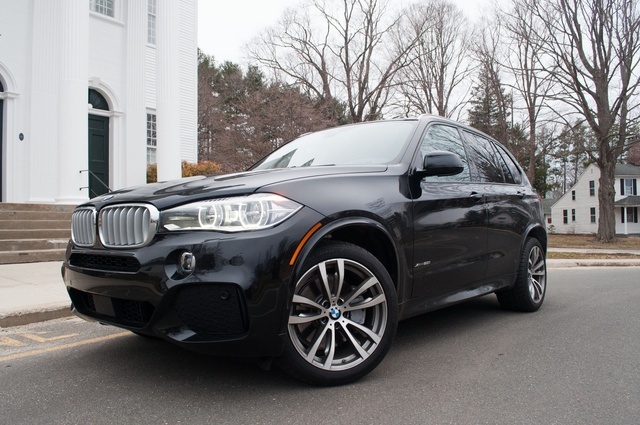 Have you driven a 2015 BMW X5? Which care cost less to be repaired BMW or ACURA MDX. Which one is more reliable? For some reason the application process for financing is not able to find me ???? do i need to disconnect the battery of 2015 BMW X5 35i if the car is not going to be used for 6 weeks?